When I saw the first photos of DC Superheroes Series 3 Batman, I was excited to see we were finally getting a super-poseable version of my favorite superhero. When I got the figure in my hands, I was still pleased. The sculpt was great, the articulation was great... but there was something lacking: the color scheme. Batman's traditional colors are blue and gray, but he started out in black and gray in the very early comics. This made perfect sense - people think of bats as black, even if many of them are actually brown (or even white). Black also works well in terms of camouflage at night. It's the traditional color of "cool," and it's often connected with death. In those early comics, blue was only used as a highlight, to give the black cape and cowl a 3D effect because black is such a flat color. Of course, the blue was also more visually appealing to children and popped more on the page, so eventually it took over the entire outfit. Within just a few years this was Batman's iconic look, though some artists (such as Frank Miller and Tim Sale) have brought back the black-and-gray whenever possible. While I grew up with the blue and gray Batman, I have to admit it doesn't make a whole lot of sense. Bats aren't blue. The only good argument I've ever read in favor of the the blue outfit (aside from the marketing angle) is that blue is a better camouflage color than an all-black outfit; but from the limited research I've done on the web, black appears to make for good urban camouflage. 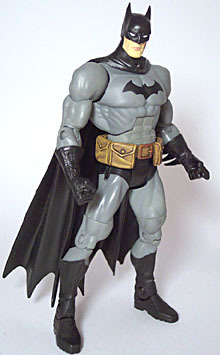 The first 6" Mattel Batman figure was the well-received Zipline Batman, who came in black and gray. The first wave of DC Superheroes featured a blue and gray repaint of that figure (sort of - it was a bit more articulated and some of the sculpting was retooled). 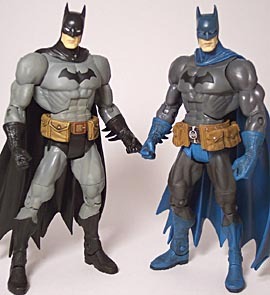 Both the gray and the blue colors were relatively light, and matched Batman's color scheme in the '40s-'60s as well as his 1970s and 1980s cartoon incarnations. I'm not sure what happened with the DCSH Series 3 Batman. It's pretty clear from the heavy detailing (particularly the belt) that the Four Horsemen intended this to be a modern Batman, probably inspired by Jim Lee's work in the "Hush" storyline. But the color scheme is wrong - not just for the "Hush" Batman, but for Batman in general. Let's compare DCSH3 Bats with DC Direct's "Hush" Batman. That figure had a light blue/gray bodysuit and dark blue on the cowl, cape, boots and gauntlets. The DCSH3 Batman, on the other hand, has a dark gray bodysuit and a light blue cowl, cape etc. It's like a reverse-negative image of the Hush Batman, and it just looks off. Had the gray been lighter or the blue darker, it might have worked; but as it stands, this is a color scheme Batman has never had (at least, not to my knowledge). For me, this meant that the DCSH3 Batman was ever-so-slightly disappointing. Enter the eighth wave of DC Superheroes and the black-and-gray Batman repaint. Not only is this my preferred color scheme for Mr. Wayne's alter-ego, it also looks far better on the action figure. 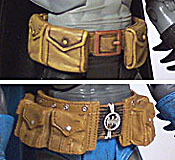 The sculpt is identical to the DCSH3 Batman, with one significant improvement: the utility belt. The DCSH3's belt was huge, and it limited some of the usefulness of the hip articulation. DCSH8 Bats has the belt from the first series. Not only do I find it more aesthetically pleasing, but it restricts the hip movement less. Unlike that of the DCSH1 Batman, this figure's belt has a great wash that makes it look as good, if not better, than the third series figures' belt. The gauntlets, since they're separate pieces, are molded in black, as is the cape. The cowl, boots, and briefs are painted. Another improvement over the DCSH3 figure is the texture of the light gray; where it was somewhat glossy and "toy-like" on the reverse-negative Bats, here it's flat gray - much closer to DC Direct's work on the "Hush" figure. Since it's a repaint, this figure has the same articulation as its predecessor: balljoints at the neck and shoulders; hinges at the elbows, knees and abdomen; swivels at the biceps, forearms and thighs; and those weird, cool post/hinge joints on the hips to give these figures the range of motion of ball joints while maintaining most of the sculptural integrity. DCSH8 Batman comes with only two flimsy Batarangs as accessories. For an MSRP of nearly ten bucks, one would hope for at least a piece of a Build-A-Figure, but two Batarangs are better than some giant goofy grappling gun, I guess. (Unfortunately, neither of the Batarangs are my particular favorite type [bottom right], which came with the DCSH3 Batman.) Like the DCSH3 Batman, he can only hold them by squeezing one edge into the slit on his left fist. This is the Batman action figure I've been waiting for my whole life. With the exception of the somewhat steep retail price, I have no complaints. I like the look of the upcoming DC Universe "Crime Stopper" version, which is essentially the classic Neal Adams 1970s-era Bats, but in terms of a modern, badass Batman, it doesn't get any better than this. Bravo, Mattel.